In the forthcoming Votes from Seats, Rein Taagepera and I build on the earlier argument of Bergman, Shugart, and Watt (Electoral Studies, 2013) about incentives of political parties to “manage” the competition among their candidates under various intra-party allocation rules. The short version of the story is that parties under open-list PR should be willing to tolerate “laissez faire” competition, because no excess in the number of candidates nor imbalance in the candidates’ votes can affect the party’s ability to convert its collective vote total into a proportional share of the seats (within the limits of the district magnitude and inter-party allocation formula). The claim about laissez faire competition under OLPR rests on the assumption that parties are only interested in seat-maximization, and not in the precise set of candidates who win. It also rests on the assumption that “party” and “list” are the same thing. The second assumption is already relaxed in Votes from Seats, where we devote almost an entire chapter to the topic of how alliance lists work, focusing on the cases of Brazil, Chile, and Finland. In these systems (and some others) many lists contain candidates of two or more parties. In that case, the parties on the list are in direct competition with one another for a share of the seats won by the list as a whole. Thus parties would need to manage their vote–i.e., concern themselves with the distribution of votes across their candidates. The first assumption–regarding parties’ indifference about their personnel–is not something we actually believe is true in practice. Science involves making simplifications, and we show in the book that using this simplifying assumption is quite powerful in predicting, via deductive logic, the average patterns in the preference vote shares of candidates (i.e., candidate votes divided by total list votes in a district). So, for the purposes of the book (and the earlier article), the strict assumption of indifference worked to get us a step farther down the road to understanding how electoral systems shape candidate vote shares. In earlier drafts of the book, we worked on attempts to analyze how parties might affect the election of specific candidates, even though they lack ranking control, through nominations. We took these sections out because we were unable to come up with a deductive model of the process–a key methodological criterion around which the book is based. In the remainder of this entry, I will post and discuss two graphs that we took out of the book but that demonstrate the (still underdeveloped) idea of parties’ engaging in forms of intraparty management–even under OLPR. The immediate reason for returning to think about this now was the recent American Political Science Association annual meeting, at which I presented a paper with Åsa von Schoultz that incorporates both the logical models of preference-vote distribution and the personal vote-earning attributes (PVEAs) of the candidates themselves. On the same panel was a fascinating paper by José Antonio Cheibub and Gisela Sin, which (among other things) analyzed the discontinuity in ratios of one candidate’s votes to the next candidate’s when they are sorted in descending order by preference votes. 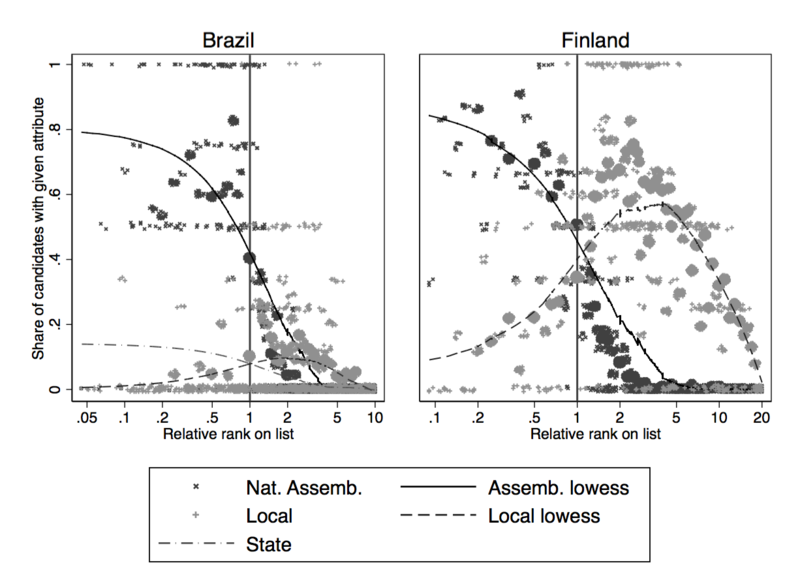 They find that, in Brazil, there is a tendency for these ratios to be greater at “last winner to first loser” and at “first loser to second loser” than among winners higher up or losers lower down. A pattern like that found by Cheibub and Sin would not be found if there were not some “coordination” going on. Such coordination could be done by voters or by interest groups or others with a desire to see certain candidates elected over others. Or it could be done by parties. If by parties, it would be a form of intra-party management. For instance, parties could achieve a desired concentration of votes on the eventually elected candidates by ensuring a mix of candidates appealing to different groups of voters, or through allocating campaign resources, or some mix of these and other tactics. One way to manage the vote would be through exploiting the party’s knowledge of the relative appeals of specific candidates or types of candidates. If the party had perfect information, it could renominate just the right number of incumbents and nominate the right number of local council members, or other politicians with popular appeal and whom the party sees as promising future legislative personnel. In other words, through nominating candidates with given PVEAs it could structure the balance of different traits and constituencies represented within its delegation. The following data plots from Brazil and Finland point towards how such PVEA management might work. The plots show the share of candidates at any given relative rank (list position/seats won) who have a given PVEA: incumbent assembly (national) member or local council. 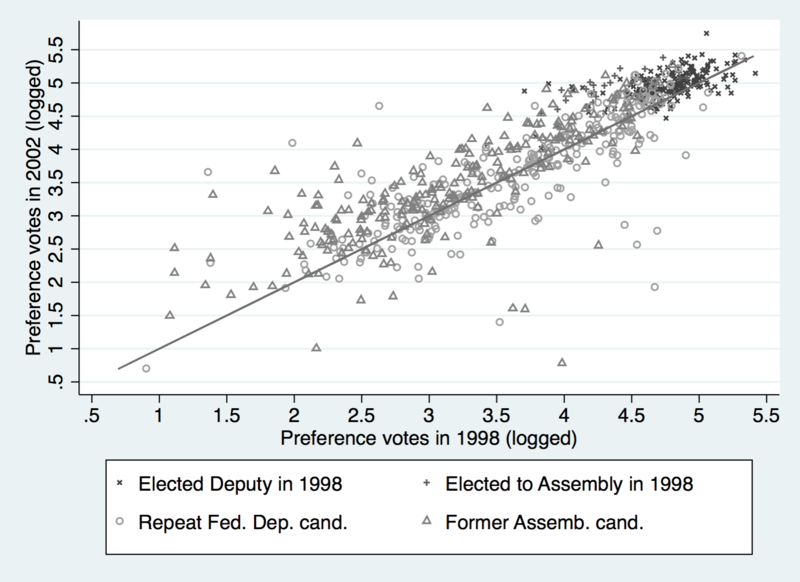 The local regression (lowess) curves plot the pattern, and in the case of Brazil, I also plot a lowess for the state assembly members running on the deputies list (but not the data points, because of the clutter). The incumbent MP curves for the two countries are nearly identical, with relatively few MPs losing and more near the top preference vote totals. The local candidates’ curves also have a similar shape—rising near the bottom of the electable ranks on the list and then still rising among the top losers, before plummeting. The obvious difference is that there are a lot more locals in Finland than in Brazil. The curve for Brazilian state legislators running for federal deputy looks like a much-flattened version of the incumbent deputies’ curve. These plots may be showing that parties are indeed managing the distribution of votes across candidates. They are doing so by whom they nominate. They probably have pretty good information about the vote-earning potential of various candidates, and they can “clear a path” for the candidates they consider sufficiently valuable by not putting too many similarly strong candidates on the list against them. Obviously, what I have shown here does not prove that point, but it is suggestive of how parties might “coordinate” on the intraparty dimension, through managing the types of candidates they select. A possible objection is that parties could not possibly know the votes that a candidate could bring to the list. After all, these lists–especially in high magnitude districts–are so competitive! Another graph suggests it might not be so hard for parties after all, at least when nominating candidates who have run before for some office. Parties amaze sometimes at how good they are with this stuff! Certainly, when I see things like this I realize that all the old ideas about chaotic competition in OLPR or parties lacking control just do not stand up. So, yes, parties can tolerate laissez faire competition among the candidates on their list–provided they are interested only in maximizing the list’s seat total. And assuming that this is all they care about allows us to understand average patterns of vote distribution. A key goal is to introduce other variables–notably PVEAs–to understand how individual candidates deviate from these logically predicted (and empirically confirmed) averages. That was the point of the von Schoultz-Shugart APSA paper, focused on Finland. The next step is to try to understand PVEAs and prior vote totals as a window on how parties manage the vote, even under OLPR. This entry was posted in Baltoscandia, Brazil, Party lists and tagged Brazil, Finland, OLPR, open lists. Bookmark the permalink. Best case I know of that violates assumption 1 is Komeito in Japan’s upper house national tier with OLPR. Candidates are assigned geographic turf and supporters vote accordingly to elect the correct “serious” candidates. See: Smith, Daniel M. 2014. “Party Ideals and Practical Constraints in Kōmeitō Candidate Nominations.” In George Ehrhardt, Axel Klein, Levi McLaughlin, and Steven R. Reed (eds. ), Kōmeitō: Politics and Religion in Japan, pp. 139-162. Berkeley, CA: The Institute of East Asian Studies at the University of California, Berkeley. To what extent does the order on the ballot affect intraparty competition? In a fully-open list, parties could use whatever order or orders they like. This is an ongoing research question of several scholars I know. So, stay tuned. It is worth noting that several OLPR systems don’t have ballots that list the candidates. The voter simply writes in a number (or name). Of course, there still has to be a literal list somewhere, on which the candidates are in some order (not rank!). That could be alphabetical (it usually is in Finland, and is posted in polling places), or could be some other order determined by the party. But in many of these systems, campaign literature is mostly prepared by candidates, who just indicate their number. Thus voters might go to the polls never seeing a list, and just write in the number of the candidate they know or who impressed them with some campaign statement. Elsewhere, of course, ballots actually do list candidates, and the parties may thereby be able to privilege some candidates through “primacy” effects even though they can’t do so through a rank giving them actual priority.